The Pup'prentice Project actually started with the name Pup'prentice, created by teacher and Reading with Rover team member, Brian Daly. We don't really remember the occasion for this clever word, but we loved it so much we trademarked the word Pup'prentice and built a program around it. Brian became one of our very first Pup'prentice enrollees with his puppy, Jett. 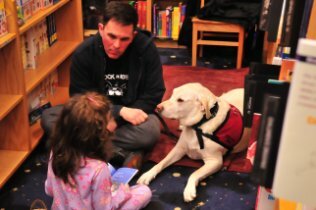 They are now a therapy dog team and they regularly volunteer with Reading with Rover along with Brian's wife, Cathy and their other therapy dog, Silas. Becky Bishop is a dog trainer for Puppy Manners, Executive Director for Reading with Rover, and a pet therapy evaluator. Becky had an "Ah-Ha" moment. As she and her friend Annemarie, who teaches pet therapy classes, watched these young pups practice "sit, down, wait and off", Becky realized she could build a program that would incorporate these new skills into puppy therapy-dog training. Annemarie enthusiastically agreed! Puppies learn quickly and they need lots of socialization. There was really no reason why people had to wait until their puppy was a year old to start socializing to pet therapy situations and become familiar with the pet therapy test. If there was a program that could help puppies prepare early and become familiar with pet therapy situations with roll play, they would be so much more prepared for the journey of volunteer pet therapy. To be able to work with a group of people that were on the same page, just seemed to make sense! Even if the puppy owner has no intention of moving on to pet therapy, the social experience of Pup'prentice makes for a better family dog! So, the Pup'prentice Project was born from a word that we thought was educational and fun! It is also our strong desire to help build the Reading with Rover program. So many children in our community benefit by being able to connect with a dog, and even if it's just for an hour, it can be life changing. We need more pet therapy teams and had hoped, and now know, that the Pup'prentice Project would make a difference. Our Pup'prentice puppies are taking and passing their therapy tests and some have actually gone on to be higher level volunteer dogs such as a comfort dogs for people in crisis situations. Puppies need a variety of experiences in order to develop into well-rounded dogs. 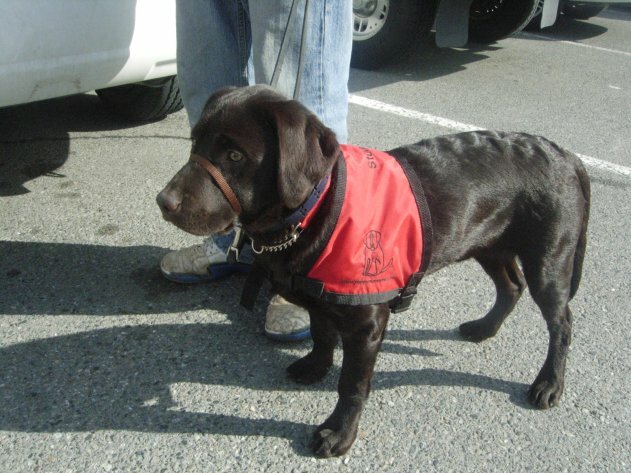 We know it can be intimidating working with your puppy in public places. We also know it's great to work with people who are all on the same page. When you meet up with 10 to 20 other Pup'prentices, it's far less stressful and hopefully very helpful. We decided to make this an official program with the puppies having matching vests and the handlers having Pup'prentice badges that identify them as part of the project. All of these things are a regular part of pet therapy and we know that the puppies and the people need to be prepared. Pet therapy is not just about obedience or having a nice dog, it's a commitment to your dog and, more importantly, to your community. We are deeply committed to the Pup'prentice Project and the members that are involved. It's a special journey you can take with your puppy and it's rewarding to watch these young puppies become dogs volunteering within their communities and to know that we got to play a small part in their success. We decided right away that the Pup'prentice Project would not be a substitute for training. We want people to be in a training class or working privately with a trainer and we encourage you, if you are considering being a Pup'prentice, to stay in a training program because with puppies you really can't practice enough! 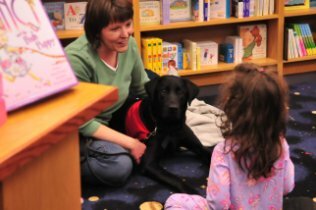 Our first group of Pup'prentices started in 2008 and many of them have since passed their therapy tests and are now actively involved in pet therapy programs such as Reading with Rover.